The 1936 Goudey Wide Pen Premiums Baseball Card Set (R314) feature 3¼" by 5½" black & white photos printed on thin paper, with blank backs. Some of the key 1936 Goudey Wide Pen Premium Hall-of-Famers include: Jimmie Foxx, Joe DiMaggio, Bob Feller, Hank Greenberg and Carl Hubbell. Issued over a two year period, R314 actually has has four different subsets. Type I is the only 1936 Goudey Wide Pen subset with "Litho in U.S.A." on the bottom right border and was printed on white paper stock. The Type II Wide Pen cards were printed a creamy paper stock and do not contain the litho. Both of these subsets were issued in 1936 and are fairly common and contain 143 cards, 11 of which are variations. Types III and IV are considered to be the 1937 Goudey Wide Pen Set, even though they are very similar in appearance. Type III cards can either have creamy borders or no borders at all. Type IV cards feature Canadian players on creamy photo stock. 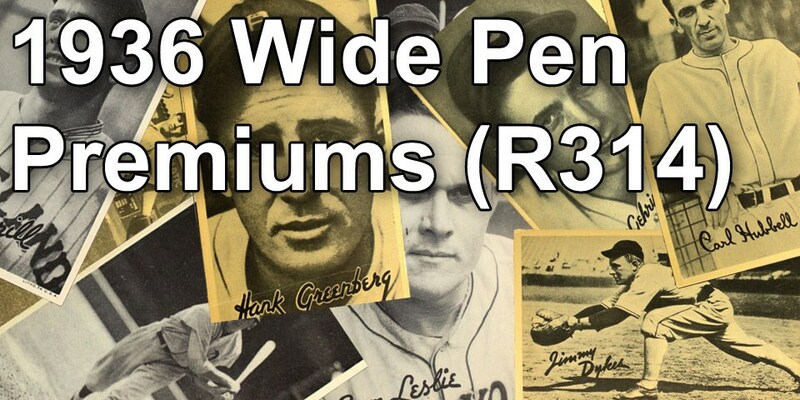 CLICK HERE if you want to sell your 1936 Goudey Wide Pen Premiums (R314) Baseball Cards. Showing 1 to 92 of 92 products. Fielding / No USA on Bottom Right Border Field,Fielding,No USA,No U.S.A.